The youngest-ever U.S. Ambassador to the United Nations, Samantha Power has been a leading voice internationally for principled American engagement in the world. One of TIME’s “100 Most Influential People,” she has spent half of her career explaining complex geopolitical events as a Pulitzer Prize-winning author, war correspondent, and Harvard professor – and the last eight years helping to shape them. In April, 2017 she returned to teaching, as the Anna Lindh Professor of Practice at Harvard Kennedy School and Harvard Law School, where she is writing a book, The Education of an Idealist, which will chronicle her years in public service and reflect on the role of human rights and humanitarian ideals in contemporary geopolitics. As the 28th U.S. 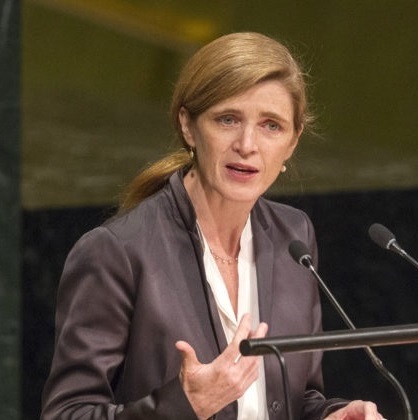 Ambassador to the U.N., Power became the public face of U.S. opposition to Russian aggression in Ukraine and Syria, negotiated the toughest sanctions in a generation against North Korea, lobbied to secure the release of political prisoners, and helped mobilize global action against ISIL. From 2009 to 2013, she served on the National Security Council as Special Assistant to the President and Senior Director for Multilateral Affairs and Human Rights. She also wrote the New York Times bestseller Chasing the Flame: Sergio Vieira de Mello and the Fight to Save the World (2008) and was the co-editor of The Unquiet American: Richard Holbrooke in the World (2011). The 2017 memorial edition of Elie Wiesel’s seminal memoir, Night, opens with a tribute by President Obama and foreword by Power. Before joining the U.S. government, Ambassador Power was the founding executive director of the Carr Center for Human Rights Policy at the Harvard Kennedy School, a columnist for Time, and a National Magazine Award-winning contributor to the Atlantic, the New Yorker, and the New York Review of Books. Ambassador Power began her career as a journalist, reporting from places such as Bosnia, East Timor, Kosovo, Rwanda, Sudan, and Zimbabwe. At the age of nine, Power immigrated to the United States from Ireland. She earned a B.A. from Yale University and a J.D. from Harvard Law School.